The MineralPRO Bottle-Less Cooler Kit allows the MineralPRO Drinking Water Systems (RO and UF) to supply healthy mineral alkaline water to MineralPRO’s Bottle-Less Coolers. This premium grade Bottle-Less Cooler Kit features a 3/8″ tube that supplies the cooler – this delivers more water with less pressure drop than a standard 1/4″ tube. 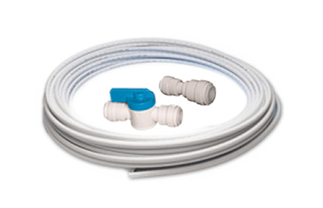 ttings and tubing required to connect any of MineralPRO’s Bottle-Less Coolers to either of MineralPRO’s RO or UF Drinking Water Systems.